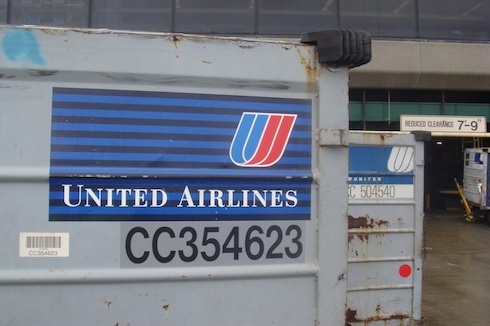 United Airlines graciously hosted a group of Flyertalkers at San Francisco International Airport two weeks ago, offering a behind-the-scenes tour that included a peek into UA’s Ops Center, baggage claim system, and a walk around the tarmac. There were 20 of us total and we were split into four groups of five. Our tour guide, Frank Lara, was tremendous and offered insight into what goes on behind the scenes that I never considered, especially in regards to how UA handles late arriving flights and misconnecting passengers while they are still in the air. I was fortunate enough to have taken part in a similar tour in Chicago a couple years ago, but one thing we did this tour that I thought was especially intriguing was take a look into the cargo hold of a Boeing 777-200. While I single out Mr. Lara, all of the UA employees that "put up" with us on this two hour tour deserve my praise. Baggage handlers, cargo loaders, refuelers, pilots, and ops workers all stopped to chat along the way, making for a very worthwhile and educational tour. Next Article TSA Gropes Six-Year-Old: How is this Keeping us Safer? Excellent pics! Thanks for sharing ’em.